Polycarbonate Pitchers Are Used Beverage Service Items For Use In Cafés, Diners, Restaurants, Cafeterias And Other Foodservice Applications. 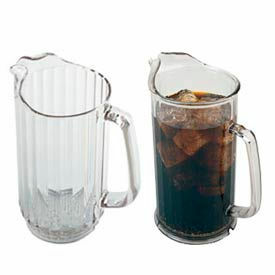 Polycarbonate Pitchers are made for long lasting use, durability and dependability. Various recognized brands offer wide selection of lightweight pitchers that resist chipping and breaking, allowing them to survive drops and crashes. Ice-control, contoured lips reduce spills and makes pouring easy. Broad or Slotted bases provide stability and allow for complete and sanitary drying. 32, 48, 60, 64 and 72 oz. capacity pitchers are available in 5-3/4 to 7-7/8 inch diameters, 6-3/4 to 9-3/4 inch heights and Clear, Amber, Margarita Green, Ruby Red and Cobalt Blue transparent colors. Carafes Are Great For Beverage Service In Restaurants, Coffee Bars, Refreshment Areas And Many Other Foodservice Environments. 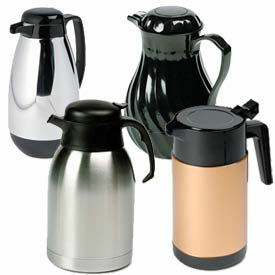 Carafes allow neat and efficient service of hot or cold beverages while maintaining beverage temperature. All carafes feature easy-pour lids and are dishwasher safe. Carafes are available in Glass, Stainless Steel and ABS Plastic in a variety of color finishes, body styles and sizes. Choose from several trusted brand names. Straight Sided Pitchers Are Used Beverage Service Items For Use In Restaurants, Buffets, Banquet Halls, Refreshment Areas And Other Foodservice Applications. 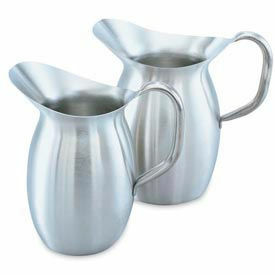 Straight Sided Pitchers are made of solid stainless steel for long lasting use, durability and dependability. Used for convenient and efficient service of water and other beverages in various foodservice applications. Easy carry loop handle design. No ice guard. Available in 14, 20, 33, 50, 64 and 66 oz. capacities and various package quantities. Beverage Service Vessels Are Used Table Service Items For Use In Restaurants, Cafés, Diners, Cafeterias And Other Foodservice Applications. Beverage Service Vessels are made of corrosion-resistant stainless steel or porcelain for long lasting use, durability and dependability. 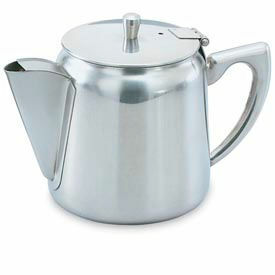 Various recognized brands offer wide selection of size and style vessels for use in various table service applications. 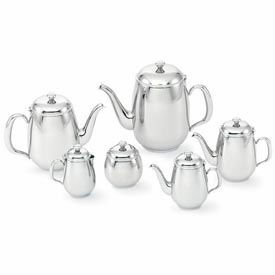 Include Coffee Pots, Covered Creamers, Covered Sugar Bowls, Gooseneck Teapots, Open Creamers, Tea Pots, Water Pitchers and more. Easy to clean and maintain. Capacities and package quantities vary per model. Bell Shaped Pitchers Are Used Beverage Service Items For Use In Restaurants, Buffets, Banquet Halls, Refreshment Areas And Other Foodservice Applications. 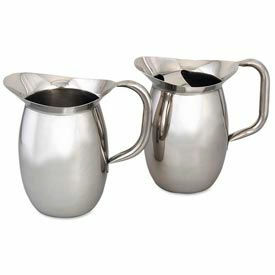 Bell Shaped Pitchers are made of solid stainless steel for long lasting use, durability and dependability. Various recognized brands offer wide selection of pitchers used for convenient and efficient service of beverages in various foodservice applications. Satin, Mirrored or Hammered finishes. Easy carry ergonomic handle designs. With or without ice guard. Available in wide range of 2 to 4-1/8 quart capacities and various package quantities. Tea And Coffee Servers Are Used Beverage Service Items For Use In Restaurants, Cafés, Diners, Cafeterias, Buffets, Banquet Facilities And Other Foodservice Applications. Tea And Coffee Servers are made of corrosion resistant stainless steel for long lasting use, durability and dependability. Hinged lids with knob tops allow easy pouring and refilling during table service. 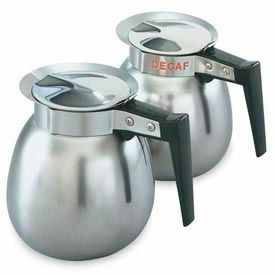 Types include Coffee Decanter, Flat Handled, Hollow Handled and various Triennium Beverage Service styles with unique triangular body design for elegant and upscale presentation. Available in 8-1/2, 10, 34 and 64 oz. capacities with selected Mirrored or Satin finishes. Coffee Decanters Are Used Beverage Service Items For Use In Restaurants, Cafés, Diners, Cafeterias, Buffets, Banquet Facilities And Other Foodservice Applications. Coffee Decanters are made of corrosion resistant all stainless steel or stainless steel bases for long lasting use, durability and dependability. Various Regular or Decaf type decanters feature hinged lids that allow easy pouring and refilling during buffet or table service. 64 oz. (2 quart) capacities. Coffee Decanter Brush with curved design and durable plastic handle used for easy and efficient cleaning of decanters also available. 10 Ounce Creamers Are Used Table Service Items For Use In Restaurants, Cafés, Diners, Cafeterias And Other Foodservice Applications. 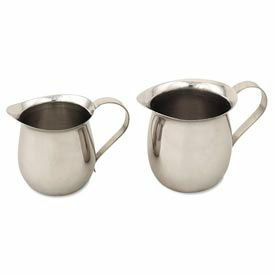 10 Ounce Creamers are made of corrosion-resistant stainless steel for long lasting use, durability and dependability. Economy and Stackable types designed with hinged covers for convenient pouring and protection against contaminants. Insulated Server features double wall construction for moisture free exterior and excellent temperature retention capability. Package quantities vary per model. Creamers Are Used Table Service Items For Use In Coffee Shops, Restaurants, Cafés, Diners, Cafeterias And Other Foodservice Applications. 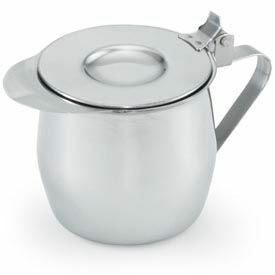 Creamers are made of sturdy stainless steel or porcelain material for long lasting use, durability and dependability. Various recognized brands offer wide selection of creamers designed for easy pouring and reduced spillage during beverage service. Types and styles include Gooseneck, Milk Carton, Bell, Tear Drop, Vacuum Insulated and more. Some include convenient flip type lids for added protection against contaminants. Available in wide range of 2-1/2 to 16 oz. capacities and various dimensional sizes. 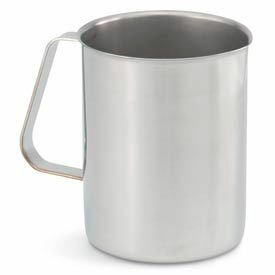 Ice Water Pitchers Are Used Beverage Service Items For Use In Restaurants, Buffets, Banquet Halls, Refreshment Areas And Other Foodservice Applications. 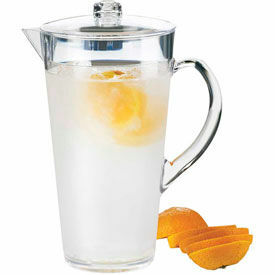 Ice Water Pitchers are made of durable stainless steel or porcelain materials for long lasting use and dependability. Various recognized brands offer wide selection of traditional or contemporary design pitchers used for convenient and efficient service of water and other beverages in various foodservice applications. Come in wide range of 12 to 70 oz. capacities and various shapes, dimensional sizes and package quantities. Insulated double wall models also available. Carlisle Premium Beverage Dispensers Are Used For Storing And Serving Chilled Beverages. Carlisle Premium Beverage Dispensers are crafted for sanitary, efficient functioning and long lasting durability. The TrimLin™ Premium Single Base features a sleek rectangular design that saves valuable counter space. With a textured lid and base, the reservoir has ergonomic handles for a secure grip. The Removable Drip Tray prevents spills and saves on clean-up time. The EconoMALAYSIA has an economical spring action faucet. All BPA free containers include labels for Fruit Punch, Iced Tea, Lemonade, Sweetened Tea and Unsweetened Tea. Available in widths of 8" and 15.75". Cal-Mil Beverage Pitchers Offer Stylish And Functional Table Service Appliances For Buffets, Catering Events, Spas And Restaurants. Cal-Mil Beverage Pitchers are constructed with acrylic, glass, and polycarbonate for long lasting durability. Available with either ice chamber or infusion chamber to create beverages on the spot. Easy to grip handle allows full hand-hold capabilities for smooth pouring. Chambers allow easy refill of ice or fruits as needed in order to keep beverages chilled and flavored. 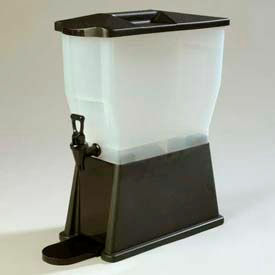 Optional three tiered drip tray stations help save space and create dimension at restaurant, hotel, and catered events. Available styles include Pitcher w/ Ice & Infusion Chamber, Pitcher w/Ice Chamber, Pitcher w/Infusion Chamber, and Pitcher Drip Tray Station. Storage capacities are 1/2 Gallon, 2 Liter, and 3/4 Gallon. Dimensions vary per model.